Not to blow my own trumpet but I still can’t get over how incredible this was! 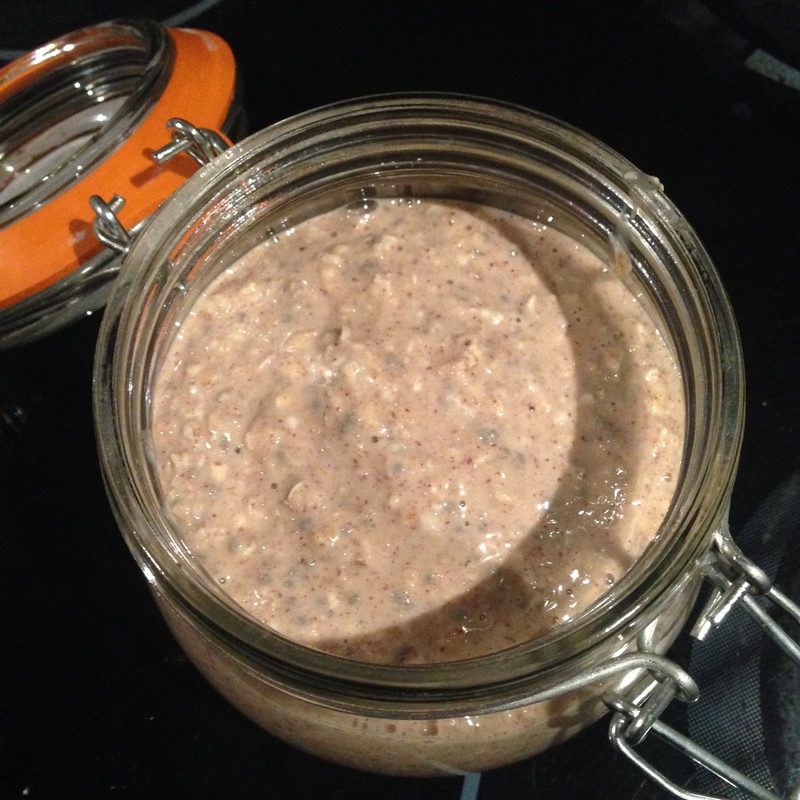 I have been wanting to try overnight oats for ages after lusting over various pictures on Instagram. If you’re on Instagram or read various health/fitness magazines and websites you might have also seen that chia seeds are incredibly popular in oats and smoothies for example. I decided to combine the two and satisfy my interest in them in this breakfast creation! This is a seriously nutritious breakfast packed full of protein, healthy fats and vitamins. Here’s a breakdown of why these ingredients are such a great way to start the day. – Chia seeds are high in fibre, rich in calcium and iron as well as antioxidants which help to absorb the toxins in your digestive system. – Bananas are rich in potassium, fibre, magnesium and add a natural sweetener to this breakfast. They are also a good source of carbs. – Blueberries are rich in antioxidants which help to boost your immune system to protect against illness. They also have anti-inflammatory properties. – Peanut butter (although it has to be healthy peanut butter!) has plenty of protein which helps to build and repair muscle fibres and will help you to feel fuller for longer. It is also packed full of good fats which will also fill you up and stop mid morning snacking! This powered a long run for me and it had everything I needed to fuel a good training session. 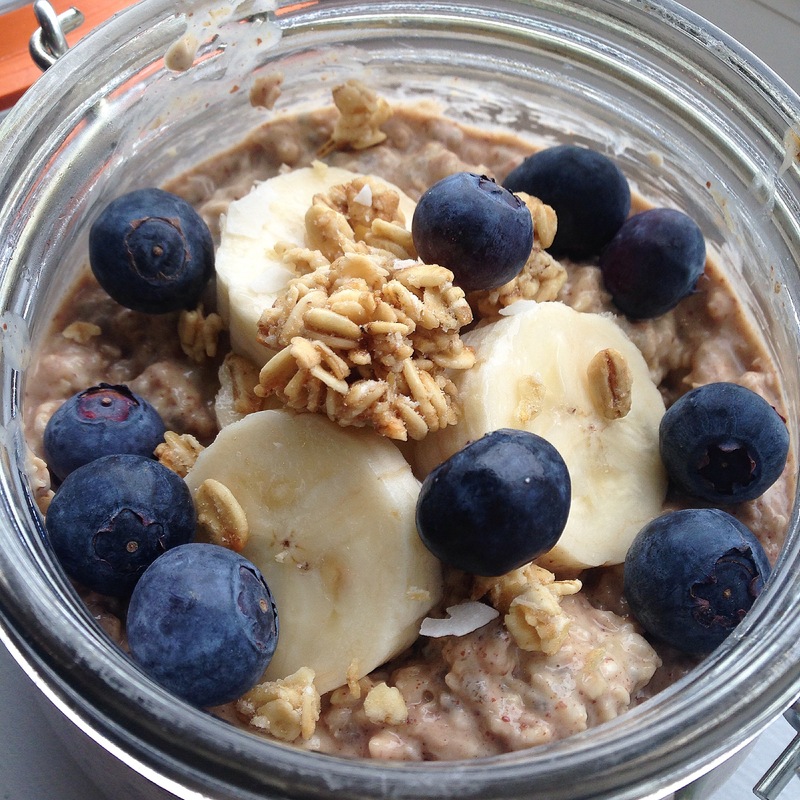 Not to mention it’s a fab way to jazz up regular porridge! Basically, eating this will fill you up, keep you full of energy and give you that warm satisfied feeling of deliciousness! – For the topping you can add anything you want – I topped mine with some more banana, blueberries and a little bit of crunchy granola because I am addicted to granola. 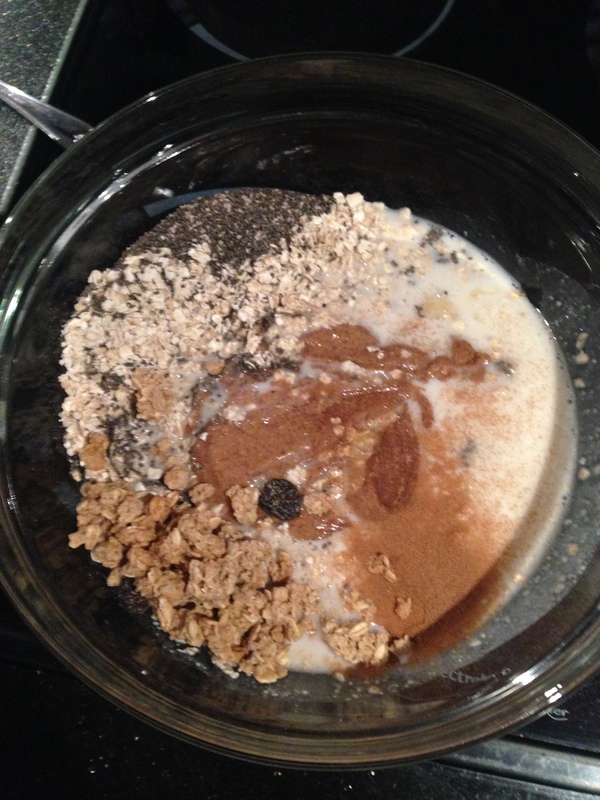 – Add the banana to the main mixture and stir thoroughly. Make sure that peanut butter is mixed in well as it has a tendency to clump together. 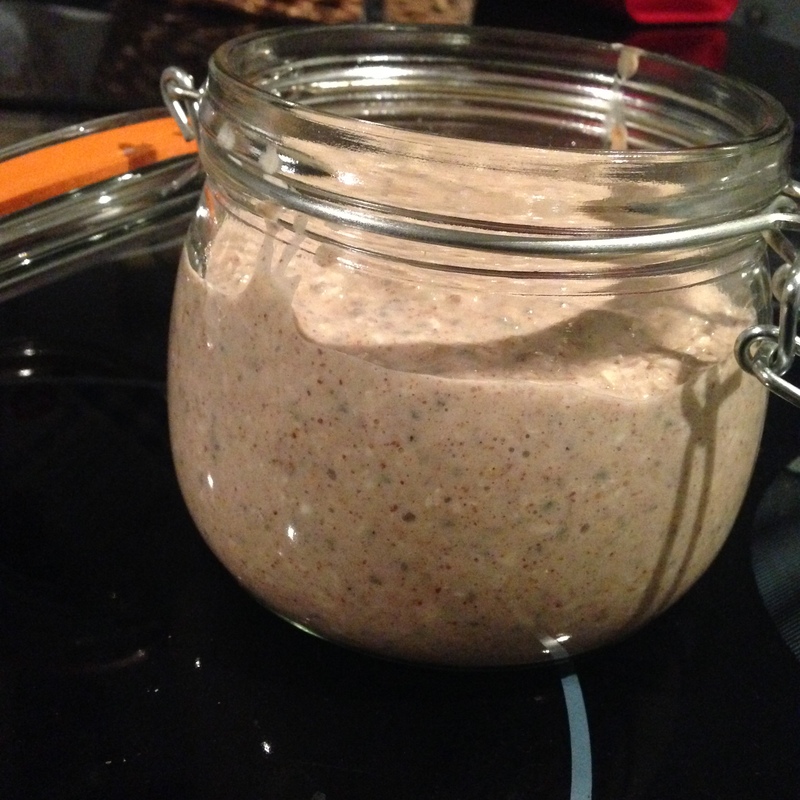 – Pour the mixture into individual airtight containers (I like the clip glass jars) and pop in the fridge overnight. If you don’t have jars then put in to bowls and cover tightly with cling film. Enjoy in the morning with your favourite topping! I was nicknamed perky pony during university so you can imagine my excitement when I discovered there was a whole range of healthy breakfasts and treats with the name PERK!ER. The bright packaging is what first caught my eye followed quickly by the fact that they are gluten free, full of goodness and offer tasty snack options as well. The healthy snack option sold it to me, plus the fact that I am a porridge fiend in the mornings and the porridge range looked really tasty. I’m not gluten free but my sister is supposed to be for health reasons, so I know she would appreciate that side of PERK!ER products. I went for the fruit berry porridge pot and the apple, cinnamon and raisin pot, but PERK!ER offer plenty of other breakfast options including PERK!ER fruity flakes and more interesting flavours of porridge such as gingerbread and raisin. The pots were so quick to make – simply boil the kettle, fill up the pot with boiling water to the marker point, pop the lid back on and wait two minutes for the perfect porridge. 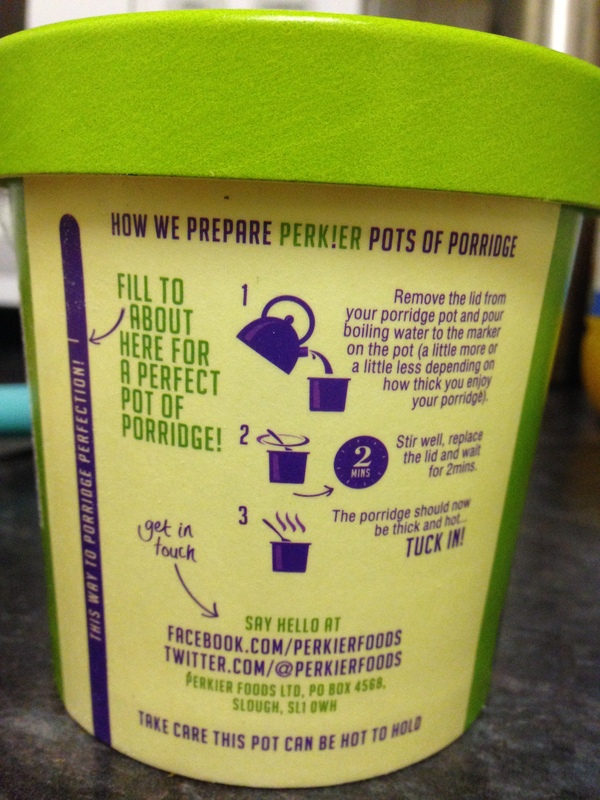 PERK!ER porridge pots are really easy to make. I tried the berry one this morning and it was filling and full of flavour but not over powered with artificial sweeteners as many porridges with flavourings are – this is all natural. 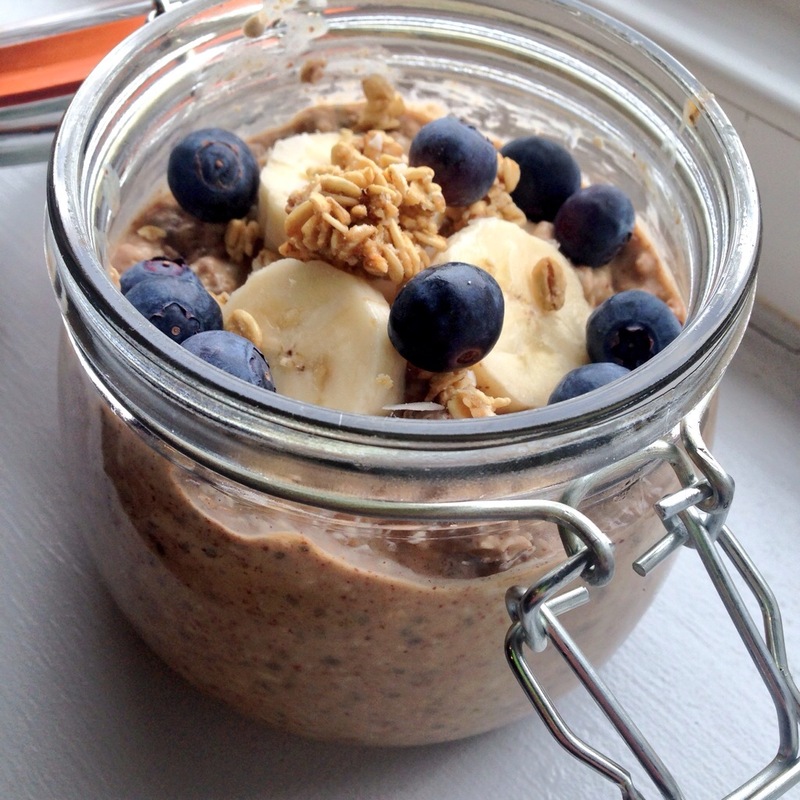 The pots are also ideal for a post gym breakfast sat at my desk at work. Rather than having to carry a sachet around and find a bowl at work, all you need is a kettle and you’re good to go. That will definitely help with my morning motivation to get to the gym- I can’t wait to try the rest of the flavours now. As well as breakfast though, they offer a range of “gloriously gluten free, fabulous and delicious treats” including Tiffin, rocky road and multi-grain bread. The best thing as well – they can be easily found at Tesco, Asda and Sainsbury’s as well as to buy online. The products are also wheat free and do not use artificial colours, flavours or hydrogenated fats. 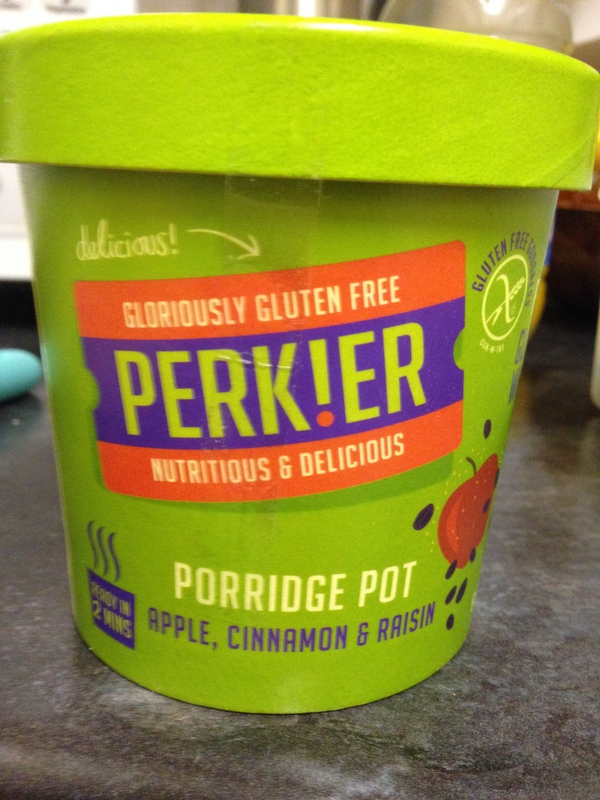 I can’t wait to try the apple, cinnamon & raisin PERK!ER porridge pot. Every Monday morning when I get in to work my Twitter feed is scattered with #meatfreeMonday Tweets. Intrigued, I decided to check it out. As a devoted meat eater I personally think I would struggle to be vegetarian but this initiative, of going meat free for one day a week, seemed like it could be doable and with added health benefits I decided to give it a go. Not only that, but the campaign is dedicated to helping the planet by reducing carbon emissions of meat production. I’ve often heard that too much red meat is bad for you yet too little can leave your iron stores depleted meaning you are left feeling tired with little energy. It’s a tough balancing act but according to Oxford University’s department of public health eating meat a maximum of three times a week could prevent an astounding 31,000 people dying from heart disease. Added incentives to join Meat Free Monday include the cost. By skipping your daily meat one day a week you could save some pennies as meat free alternatives are noticeably cheaper – an ideal time to save money with the festive season ahead. And of course there are the animals to consider as well. With all that in mind, I checked out the McCartney’s website and my meat free Monday began. My meals today were far from inventive but were more quick and easy due to being back at work after a week off and a training session to cram in – but I’m looking forward to trying out some new and exciting recipes, many of which can be found on the website, next week. The recipe I’m going to be trying next week is Deep Dark Black Bean Soup. Check it out here and I’ll post how I got on with making it next week.